No matter how your data lost, Stellar Data Recovery for Mac is all you need to recoup everything lost in the event of data disaster. Stellar Data Recovery Professional for Mac software performs flawless recovery of deleted documents, emails, archives, photos, audios, and videos from Mac based devices like iMac, Mac Pro, MacBook Pro, MacBook Air, or Mac Mini. With enhance support for multiple file systems like HFS, HFS+, FAT32, ex-FAT and NTFS, the latest version of the application (v9.0) is all the protection your Mac needs against the most complex of data threats. Getting through the defenses of password protected hard drives is no biggie for this data recovery Mac software. Simply plug-in your encrypted hard drive to the Mac on which Stellar Data Recovery Professional for Mac is installed and launch the software; you will be prompted to key in the decryption password for the drive and once you’re through, recovering lost data from it will be as easy as 1..2..3. Did one of your Mac volumes just disappear? How will you get back all the data saved on it? Relax! Mac partition recovery software ensures you regain access to your lost volumes and all data stored on them without any hassle. Version 9.0 of the product includes a dedicated “Can’t Find Volume” option for APFS, HFS, HFS+, FAT32, ex-FAT and NTFS partitions through which you can spot missing volumes on your Mac based devices and then recover data from them. Hard drive formatting though mostly beneficial has the severe drawback of erasing all data on your hard drive. If you’ve accidentally formatted the wrong Mac partition / volume or don’t have a backup to restore the lost data from, Stellar Data Recovery Professional for Mac is the knight in shining armor you need. Laced with powerful scanning algorithms, including “Deep Scan” and “Raw Scan” capabilities, the software quickly searches for missing files on the hard drive and makes them recoverable. Your Time Machine backup drive is the storehouse of all your Mac data backups. Failure of the TM drive could mean doom. Ensure your critical backups are always protected with Stellar Data Recovery Professional for Mac. Connect your TM drive to your Mac and launch the software. It will treat your TM drive as another hard drive and offer all the same options for data recovery as any other drive. The latest version (9) of Mac digital file recovery software includes major UI improvements like Turn On/Off Preview, Scanning Volume details, Scan Time remaining details, Load Scan Image, Select Region to Create Image, Customized tree-view of recoverable files discovered after scan, Updated Quick-Look view support from 10.7 to Mojave Sierra 10.14, improved preview capabilities, and many more. How to use Stellar Data Recovery for Mac? I forgot to transfer the photos from the memory card and formatted it. I was really feeling low, as there were the photos of the entire engagement ceremony of my cousin. It is Stellar Data Recovery that brought the data back. I wanted to thank you so much for the help that your support provided over the past two days. I was able to recover all of my data. Most importantly a large project I would not have been able to recreate in time for my presentation. Your support staff was very patient and helped through a very stressful time. It has all the features you'd expect from software of similar caliber, but manages to have a clean, minimalistic interface that doesn't intimidate when doing something as precarious as data recovery. My scan of a 750GB SSD volume was done in less than 4 minutes, the result showing all recoverable folders and files (a checkbox next to each allows me to decide which ones to recover). With Stellar, data recovery is a lot less painful, as you get your data back with its original file names. You also get to preview your data while the scan is ongoing. 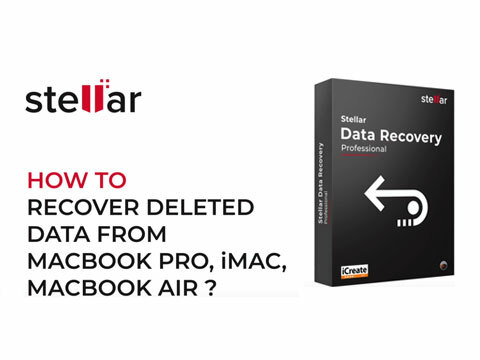 Stellar Data Recovery Professional offers swift recovery of lost and deleted files from the latest macOS Mojave, High Sierra.